Brand new for 2019! Scotway House is an ultra-modern, tech-savvy accommodation for students with character situated at Glasgow Harbour in the West End. 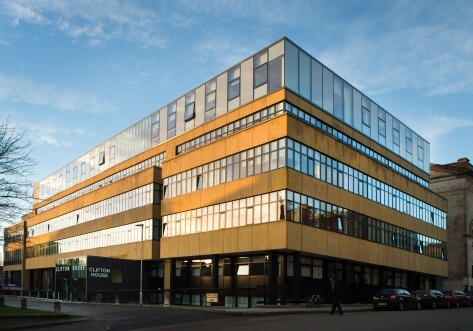 Close to the University of Glasgow and a 5-minute walk to Partick Underground, Scotway House offers River Clyde views and a separate traditionally built three-storey building just for studying and socialising. All bills are included with super-fast wifi speeds of up to 200mb per room. Room types are among the largest in the City ranging from 15 to 51 meters squared and include studios, shared apartments, 1-bedroom apartments and a top floor penthouse studio with incredible panoramic views. Scotway House is at Glasgow Harbour in the West End Close to University of Glasgow and a 5 minutes' walk to Partick Underground allowing easy access to the City Centre for Strathclyde and Glasgow Caledonian University students. Be the envy of your friends and choose one of our generous ² en-suite rooms. 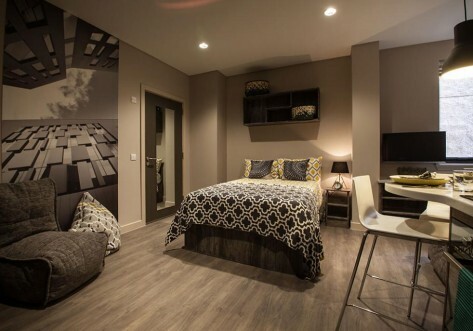 These rooms are modern and beautifully designed with a small double bed, study area and super fast Wi-Fi of up to 200mbs. You have your own en-suite shower room, ample storage and fantastic cooking facilities within the shared kitchen/living room. Top, middle or bottom floor – your choice - same great price. Our premium en-suite is ultra-spacious at m². Our largest type of en-suite is beautifully designed with a small double bed, private en-suite shower room, study area and fantastic shared cooking facilities with a living area and smart TV. With impressive Wi-Fi speeds of up to 200mbs you can also choose whatever floor you like at no extra cost. Self-contained studio living starts here with m² to call your own or maybe your plus one too. Enjoy a private living experience with an en-suite shower room, double bed, bags of storage, fitted kitchen and study area. In addition, you can take advantage of own smart TV, internet speeds of 200mbs and to top it all there’s no more to pay if you want to share. Upgrade to m² if you want to enjoy the same great private facilities as our bronze studios but with extra leg room. Enjoy your own private space with an en-suite shower room, double bed, plenty of storage, fitted kitchen and study area. The room is also kitted out with a smart TV and you can enjoy super-fast wi-fi of up to 200mbs. To top it all there’s no additional cost if you want to share. We have 2 fantastic styles of gold studio ranging from to m². 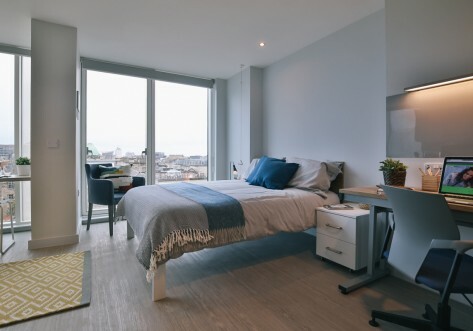 These studios are fitted out with a private en-suite, double bed, study area, smart TV, fitted kitchen and no matter what floor you choose or whether you decide to share or not the price remains the same. As with all of our rooms, you can enjoy super-fast wi-fi of 200mbs. Taking your studio living experience to a whole new level. Enjoy a private stay in a m² studio. Fully fitted out with double bed, study area, smart TV, fitted kitchen, breakfasting area and large en-suite shower room. You can enjoy super-fast wi-fi of up to 200mbs and choose to share at no extra cost. Our corner position Premium Tower Studios have an enviable m² of space with floor to ceiling windows and incredible views across Glasgow from the higher floors. Fully fitted out with double bed, study area, smart TV, super-fast wifi (200mbs), fitted kitchen, breakfasting area and en-suite shower room. Book quick if you want some of the best views in town. You can choose to share at no extra cost! Our one-of-a-kind penthouse studio boasts an impressive 33 m². It’s fully fitted out with a double bed, study area, smart TV, super-fast wifi (200mbs), fitted kitchen, breakfasting area and en-suite shower room. This unique luxury studio has South facing floor to ceiling windows with panoramic views of the River Clyde, Tallship and other Glasgow landmarks. Luxury one bedroom apartments with corner positions and a magnificent floor space of between 50 to m². 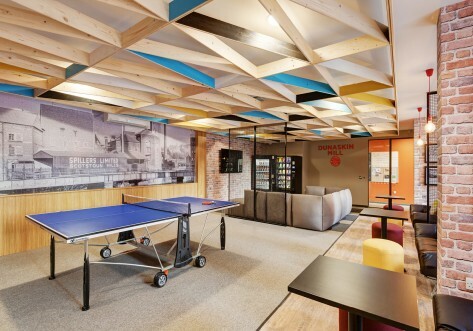 Yes, you read that right m², the largest student room in the city. The hallway gives access to a living area which is home to 2 study areas, a fitted kitchen, dining table, sofa and smart TV. As well as your bedroom with double bed, storage and en-suite shower room. This really is a home from home with super-fast wifi (200mbs) throughout the apartment and you can share at no additional cost.